The first visit of the AdVintage September 2013 wine tour of Tarragona was to a small family producer in the Alt Camp area of Catalonia, on the edge of Conca de Barberà. 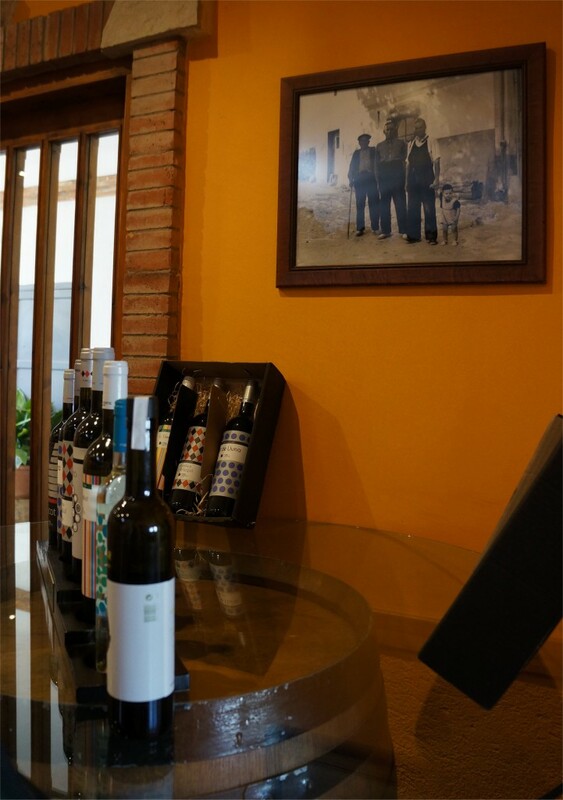 Originally a small agricultural holding bought by Vicenç Ferré in 1953, 4 generations worked the land until 2005, when the 2 young Ferré Morató brothers, Vicenç and Xavier (Xavi), decided to break tradition and concentrate on viticulture. From 4000 bottles then the vineyards now cover 42ha and produce 50,000 bottles a year. 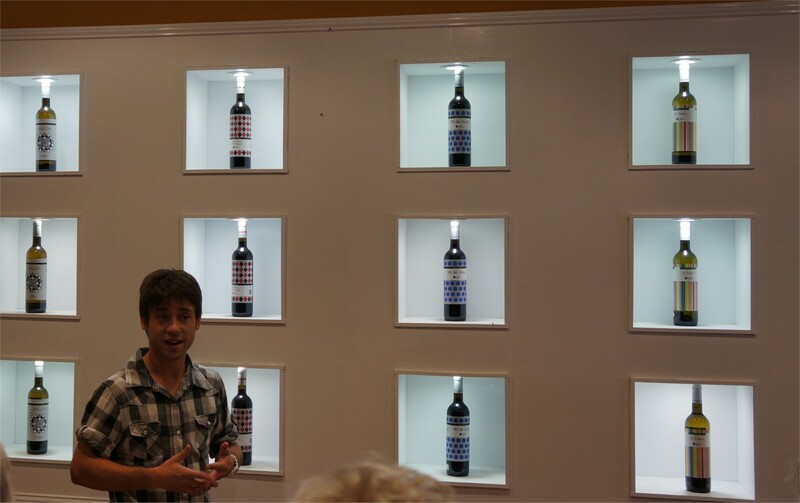 Our guide for the morning was Xavi, a sommelier who studied business and hospitality in Liverpool. Vicenç, who trained as a winemaker in the Rhône and Priorat, was on hand to say hello and help his brother during the group tasting at the end of the tour. The vineyards are in the highest part of the region just south of the town of Cabra del Camp, with spectacular views of the nearby mountains topped by wind-turbines. On the dry terrain and without irrigation the vines work hard to find water, a typical indicator of quality if the grapes are handled right. The fruit used represents the best 25% of the vineyard production, with the remainder sold to the local cooperative. 2 wines (from a range of 5) define Mas Vicenç; the light, fruity and sweet El Vi del Vent (Wine of the Wind) and the rich and structured red, Rombes d’Arelqui (Harlequin Diamonds). El Vi del Vent was first made in 2008 for the October Fira del Vent (Fair of the Wind) in nearby El Pla de Santa Maria. Organisers wanted a new wine for the festival – one from this year’s harvest – to accompany the sweet cakes also being made. Mas Vicenç accepted the challenge and harvested Muscat (Petit Grains) in early September before bottling in less than a month (around the 14th October) – it continued each year afterwards and is now a tradition (ironically the cakes never appeared as the local bakers couldn’t get them ready in time!). L’Arelqui is the prestige wine of Mas Vicenç, equal amounts of Cabernet Sauvignon and Tempranillo (known by the Catalan name of Ull de Llebre – “Eye of the Hare”) and barrel aged for 12 months in French Oak. Each year the production of this wine undergoes some small change, whether in the barrels used or grape proportion, to try and further improve it. The winery is compact, showing its gradual conversion from a farm, allowing Xavi to easily show us around the facility as he explained the different wines and techniques used. Near the store and presentation area fermentation tanks and new barrels stood next to a small press, while underneath is the cellar with barrels of Nit de Lluna, their easy drinking Tempranillo/Syrah blend. Low-volume bottle-filling, corking and labeling machines lead onto another barrel-room (a converted swimming pool) for d’Arelqui. 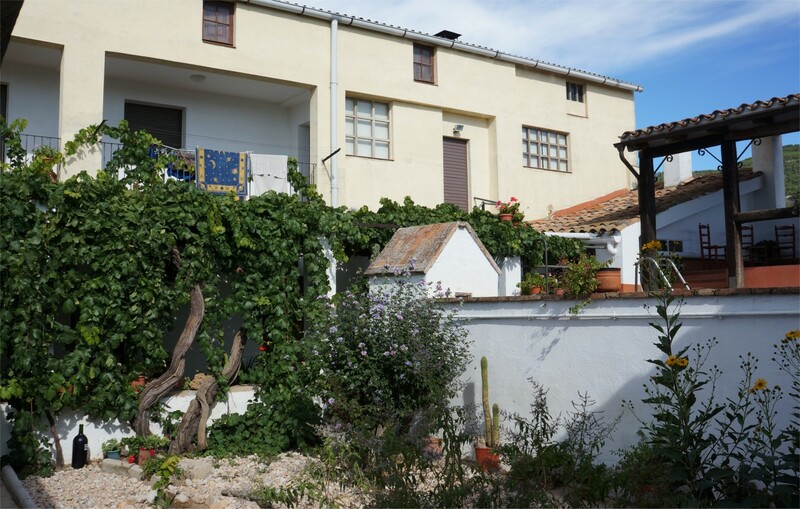 A picturesque courtyard and patio made for a perfect tasting area, where 5 of the wines were poured along with the delicious Olive Oil they also make on-site. Teras 2012. Macabeo (80%) & Moscatel (20%). 11% abv. €5. This had the grape aromas of Muscat coming through. White fruit on the palate, fresh with a gentle dryness and light, crunchy acidity. Very pleasant with a warming finish, “A wine for enjoying on the terrace”..
Dent de Lleó (Dandelion) 2012. 100% Chardonnay, barrel fermented for 6 months. 13.5%, 2,000 bottles made. (The 2013 Chardonnay was harvested 2 days before our visit, on 15th September and they had 7 new barrels waiting at €700 a piece). A deeper colour but still bright. Not overtly oaked with some pear aroma. Good texture on the palate; light spicy oak, toasty/creamy flavours with just enough fruit to balance the wood. Good character and body. Escot 2011. 100% Tempranillo (unoaked). 14%, €5.5. Youthful fruit nose, red berries. Smooth palate, simple attack with pleasant tannins, a little dry on the finish but not bitter. An easy drinking wine. Nit de Lluna (not tasted). 70% Tempranillo, 30% Shiraz aged for 12 months in used oak. 18,000 bottles made.The main wine of the estate, aged in 3-5yr barrels. Rombes d’Arlequi 2010. 50% Tempranillo, 50% Cabernet Sauvignon. 14%, €11. Deep colour with soft blackcurrant and lightly toasted oak on the nose. Ripe, concentrated fruit, well integrated with chocolate. A lingering finish with a little vanilla and caramel. A good, if not excellent, quality wine with a few years of life ahead. El Vi del Vent. Muscat de Petit Grains, harvest to bottle in 1 month – a “Muscat Nouveau”. 13.5%. €7. Fresh, fruity nose. Sweet melon on the palate, light and delicate sweetness. Our group of 30 had a great time, enjoying the brilliant sunshine, warm temperatures and even warmer hospitality of Xavi and Vicenç. The enthusiasm of these 2 young brothers and the quality of their wines was delightful to experience and left a lasting impression on everyone, even after our subsequent visits to bigger and more famous producers later in the week. This entry was posted in In Vino Veritas, Wine Producers and tagged AdVintage, Catalonia, Mas Vicenç, Spain, Tarragona. Bookmark the permalink.